Introduction: St Vincent’s Hospital, located in inner city Sydney serves areas with extreme poverty and homelessness. Although disadvantaged groups are at higher risk of developing diabetes, they often fail to access optimum care. Because organisations and primary health care teams supporting these disadvantaged groups do not provide specialist diabetes care, we implemented a Diabetes Outreach Clinic (DOC) at a large homeless men’s hostel. Methods: The Matthew Talbot Hostel (MTH) Clinic is a nurse-run health facility located within the Hostel for Homeless Men. The St Vincent’s Hospital DOC comprised a visiting Specialist Team (Endocrinologist and Diabetes Educator) and a local primary care team (General Practitioner and Clinical Nurse Specialist for Homeless Health). Six clinics were held over 10 months in the MTH Clinic, assessing pre-selected patients from the integrated Metabolic Health Clinic. The DOC aims were: (1) to provide access to specialist diabetes care for homeless men, (2) to up-skill local primary care teams, and (3) to promote linkages between primary and tertiary care. Patient characteristics: Twenty-three patients with diabetes and/or metabolic syndrome with comorbidities were assessed. All patients had adverse life-style and cardiovascular risk factors, were socially disadvantaged with difficulty accessing mainstream health services. 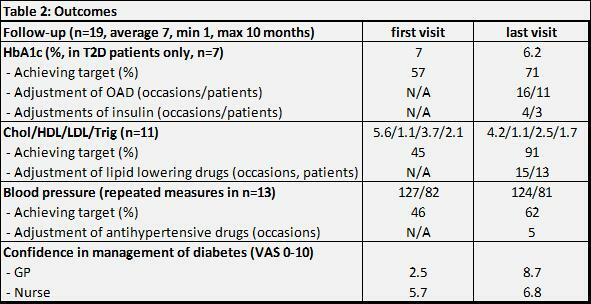 Most patients had schizophrenia treated with psychotropic medication (Table 1). Results: Two patients with treatment-resistant schizophrenia did not accept any suggested treatment changes. All others had an improvement in HbA1c, BP and/or lipid profile (Table 2). They were also screened for diabetes complications and linked into MTH preventive health clinics for smoking cessation, weight control, podiatry and optometry. No patient was admitted to hospital for diabetes-related conditions during the DOC. The GP and nursing staff received upfront teaching, email and telephone support in managing complex cases with diabetes, resulting in increased awareness and confidence in diagnosis and treatment. Conclusions: This DOC offers an innovative model of diabetes care for vulnerable populations while supporting and up-skilling their primary care team.